SuperDOP is a modified DOP-PCR WGA method. DOP-PCR provides the most reproducible and accurate detection of copy-number variations (CNVs)1 as well as even coverage compared to other WGA Methods. Like other WGA methods that either sacrifice specificity of CNV detection for high genome coverage, or genome coverage for increased accuracy of CNV detection, DOP-PCR suffers from low genome coverage. SuperDOP is superior to these methods, and provides for nearly complete genome coverage while maintaining high accuracy of CNV detection. This is achieved by increasing the duration of random priming from that typically used in DOP-PCR, phi-29, or in Bst-polymerase-based methods, without increasing formation of primer dimers. Therefore, SuperDOP is a method of choice for both single-cell genome analysis, as well as for analysis of biopsies in in vitro fertilization (IVF). The latter requires accuracy of CNV detection for Preimplantation Genetic Screening (PGS) and extensive genome coverage for Preimplantation Genetic Diagnosis (PGD). Hou Y et al. Comparison of variations detection between whole-genome amplification methods used in single-cell resequencing. Gigascience. 2015 Aug 6;4:37. doi: 10.1186/s13742-015-0068-3. eCollection 2015. The one tube, 2 reactions (A,B), SuperDOP™ WGA kit was developed for whole genome amplification of 1-10 human cells. With minimal manipulations and only ~30 min hands-on time it is less prone to contamination than most other methods. Applications for SuperDOP™ WGA products include single cell resequencing, CNV analysis using NGS, aCGH or qPCR, SNP genotyping, mutation detection. QPCR analysis of sample amplification efficiency using SYBR©Green with Rox as a reference dye is shown below. 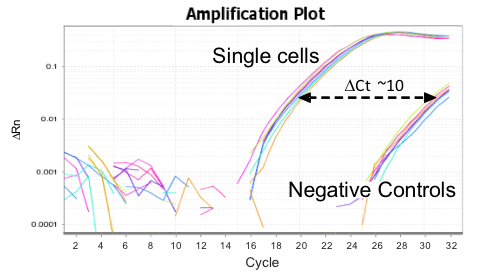 Amplification curves of individually amplified single cells come up about 10 cycles ahead of negative controls curves. Single cell DNA library (32 μl) was incubated with 58 μl of Agencourt AMPure XP beads (Beckman Coulter), washed with 75% ethanol and eluted in 50 μl of TE buffer. The eluate was diluted 1:8 with water and separated in Bioanalyzer (Agilent Technologies). Five human cells were sorted into each well of PCR plates and processed using ether SuperDOP kit or a competitor WGA kit (current leader in PGD testing). The WGA products were amplified with 70 pairs of locus-specific primers in QPCR. 1-10 SuperDOP kit, 11-20 competitor kit, 21-22 bulk human DNA.